Taking off on a Netjet private charter, ready to soar through the Rockies. Photo by Yvonne Yorke. The luxury travel companies Four Seasons and NetJets have partnered on a ski adventure to Jackson Hole and Vail. Yvonne Yorke went along for the thrilling ride. THE ROCKIES — There are times when the sum is greater than its parts. The new collaboration between the Four Seasons Hotels and Resorts and private jet charter company NetJets is an inspired pairing – delivering insane access on trips to the Rockies, Hawaii, and Europe. I recently was a guest on their Mountain Adventure experience to Jackson Hole, Wyoming, and Vail, Colorado — six days where everything was as custom, bespoke, and exclusive as a ski trip could be. Because NetJets is a charter, the journey usually begins wherever the travelers are. But this was a special trip, and everyone flew from their home cities to our first stop, Jackson Hole, a 48-mile-long valley set against the dramatic expanse and beauty of the Grand Teton Mountains. The town of Jackson maintains much of the frontier feel of its 1800s Wild West past. I saw stop signs in town that read a whimsical “Whoa” instead of “Stop.” At any of Jackson’s watering holes, such as the Million Dollar Cowboy Bar downtown, with its famed saddle-shaped bar stools, you almost expect a cowboy to stride (or ride) in. It’s no wonder that Django Unchained, Dances with Wolves, and The Big Trail (John Wayne’s first speaking role) were filmed around here. But don’t let the small-town ambiance and laid-back mountaineering vibe fool you. The historic town square, with its iconic archway of 2,000 elk antlers, is surrounded by designer boutiques, cutting-edge home furnishings stores, and fine art galleries. Jackson is considered a center of art in the United States, and Teton County is one of the wealthiest counties in the U.S., with a relatively young population of 9,500 residents. 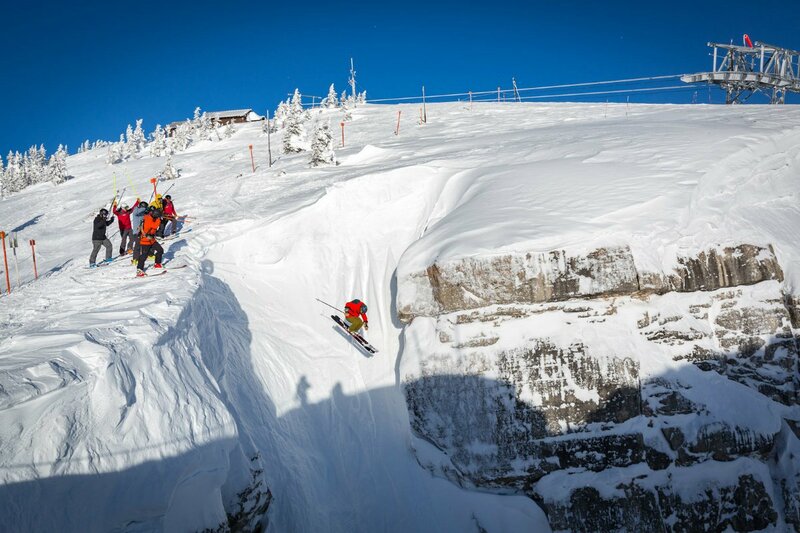 Of course, Jackson Hole is celebrated for its world-class skiing and its vertiginous, double diamond runs, including the legendary, 10,450-foot Corbet’s Couloir. Described as America’s scariest ski slope (I was terrified just looking at it), with a fifteen-foot vertical drop at the top, Corbet’s is the kind of death-defying run that separates the meek from the bold, the posers from the doers. That’s not to say Jackson Hole doesn’t have less challenging terrain – 40 percent of the trails are intermediate, and ten percent are for beginner skiers and snowboarders. 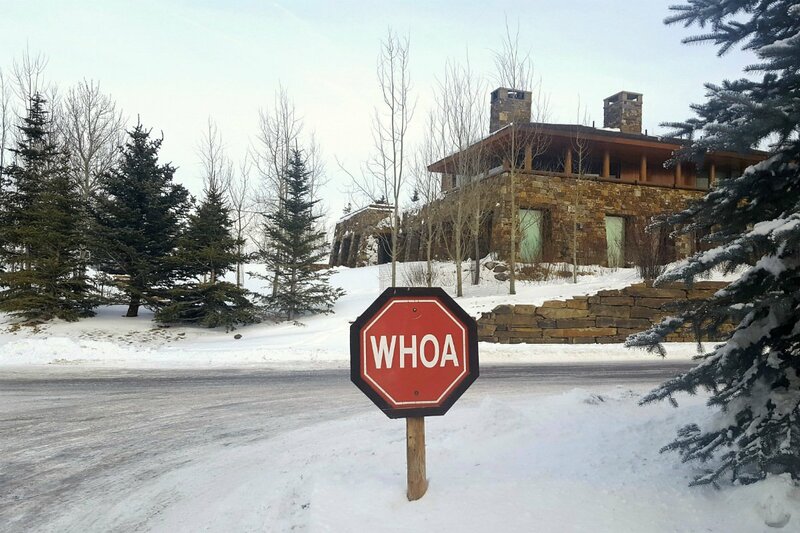 In Jackson Hole, even the stop signs are laid back. Photo by Yvonne Yorke. The treacherous 15-foot vertical drop at the top of Corbet's Couloir. 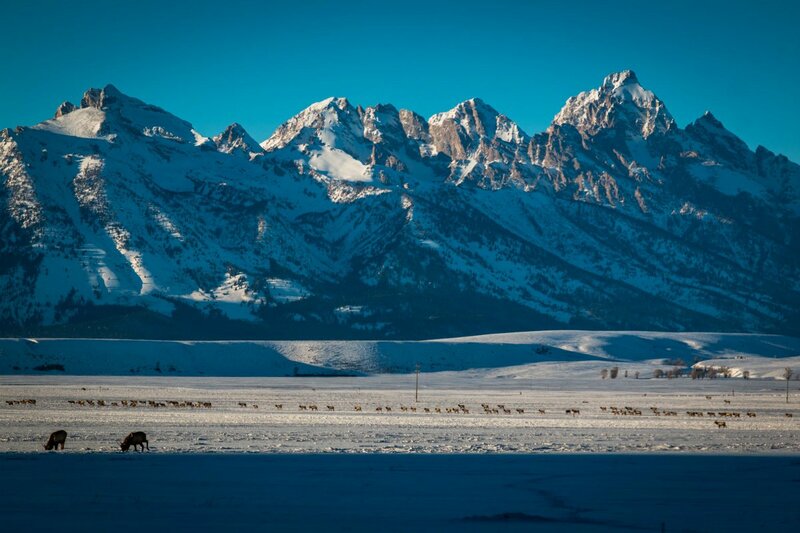 Photo courtesy of the Jackson Hole Tourism Board. 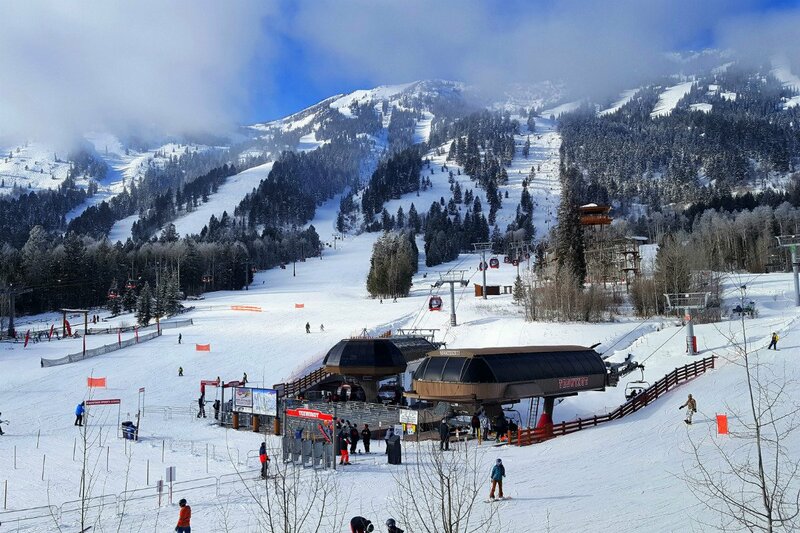 Those in the know love the location of the Four Seasons Resort and Residences Jackson Hole, the only ski-in/ski-out resort in Teton Village, where you’re literally on the slopes within a few steps of the property. The Four Seasons/NetJets program delivered many special ski perks, like getting outfitted with custom, handmade skis; having front-of-line privileges; catching fresh powder before the mountain opens to the public; and taking a private lesson with Olympic gold medalist Tommy Moe. The off-piste perks of the collaboration included a private horse-drawn sleigh rides through the National Elk Refuge, where I had up-close views of thousands of elk, and a helicopter ride to nearby Yellowstone National Park for a wildlife safari by snowmobile. The activities extended to the culinary, too. I attended an informative private mixology class and whisky ceremony at Four Seasons Jackson Hole, followed by a chef’s table dinner at Westbank Grill, where executive chef Michael Gorlaski served locally sourced Rocky Mountain elk chop and buffalo tenderloin. Dessert was a Cowboy Cookie, a large, gooey chocolate chip number baked in a cast-iron skillet topped with vanilla ice cream, created by Rhonda Ashton, the hotel’s talented pastry chef, who was fresh off representing Team USA in the Mondial Des Arts Sucre (the Olympics of the pastry world) in Paris this February. Ashton and her team had also created the incredible welcome treat I found in my room: an edible arrangement of macaroons, a sugar snow globe with candied skies, and postcards of the Teton mountains printed on edible paper. The perfect way to end the evening was under the big, cloudless Wyoming sky, stargazing with cordials at the Four Season’s Cottonwood lawn. Sitting on Adirondack chairs, keeping warm around an outdoor fire pit, we gazed up at the constellations as astrophysicist Ryan Hennessey explained the cosmos. The lobby of the Four Seasons Jackson Hole. Photo by Yvonne Yorke. One of Jackson Hole's many ski mountains. Photo by Yvonne Yorke. Elk graze in the National Elk Refuge, bordering Grand Teton National Park. Photo courtesy of the Jackson Hole Tourism Board. For the next leg of the adventure, we boarded NetJet’s Bombardier Challenger 650 private jet for a scenic, half-hour flight to Vail. The eleven-seater had a plush cream-colored leather couch and leather seats, rich wood paneling, and a conference table. They served champagne and a cheese plate, but we landed almost too quickly to enjoy them. After breathtaking mountain views, we descend into Eagle County Airport where the NetJets team awaited with a chauffeured car, oshibori hand towels, and another champagne toast. I was greeted at the Four Seasons Resort and Residences Vail by 360-degree mountain views and the Snow Angels, their dedicated butlers for guests of the NetJets program and the private residences. My Snow Angel was Kate Allan, a lovely and down-to-earth lady from Cape Town, who has lived in Vail for thirteen years. Kate can arrange anything, whether it’s heli-skiing on pristine powder, dogsledding around picturesque Turquoise Lake, or getting exclusive, early morning access to Vail’s legendary Back Bowls. She also has insider access to the town, as her boyfriend’s father was the founder of Vail. I had been looking forward to my Four Season’s gourmet mountaintop BBQ lunch at Belle’s Camp, overlooking Blue Sky Basin, and it did not disappoint. 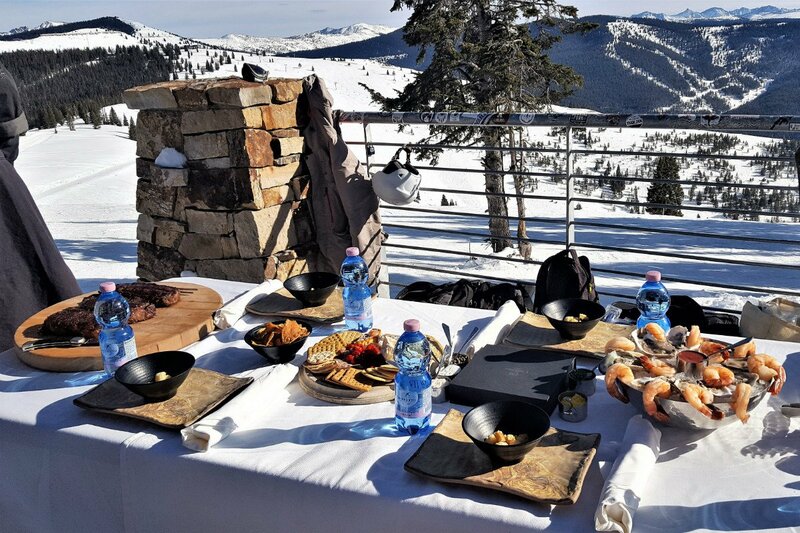 At 11,480 feet, the setting was only a little more impressive than the lunch on our table — housed-cured charcuterie and cheeses, a seafood platter, Calvisius Italian caviar, and homemade soup kept hot in thermos flasks. While we ate the delicious appetizers, the resort’s executive chef, Marcus Stewart, grilled Wagyu steaks to perfection. 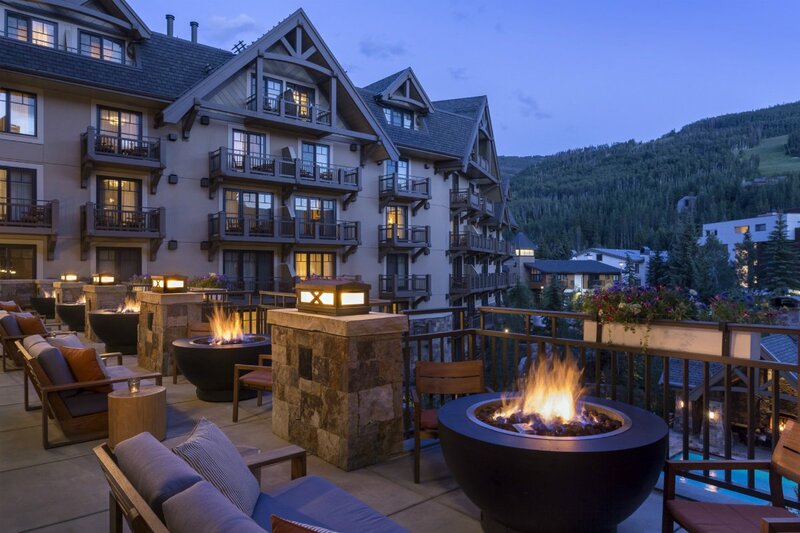 Fire pits light up the Four Seasons Vail. Photo by Don Riddle. Mountaintop lunch overlooking Blue Sky Basin. Photo by Yvonne Yorke. After a few runs with my private ski instructor, I took a leisurely stroll through the charming cobblestone streets of Vail. Four Seasons have their own full-service ski concierge team in town, housed in a three-story building which also features a full retail store operated by Gorsuch, Colorado’s premier fashion and lifestyle retailer. 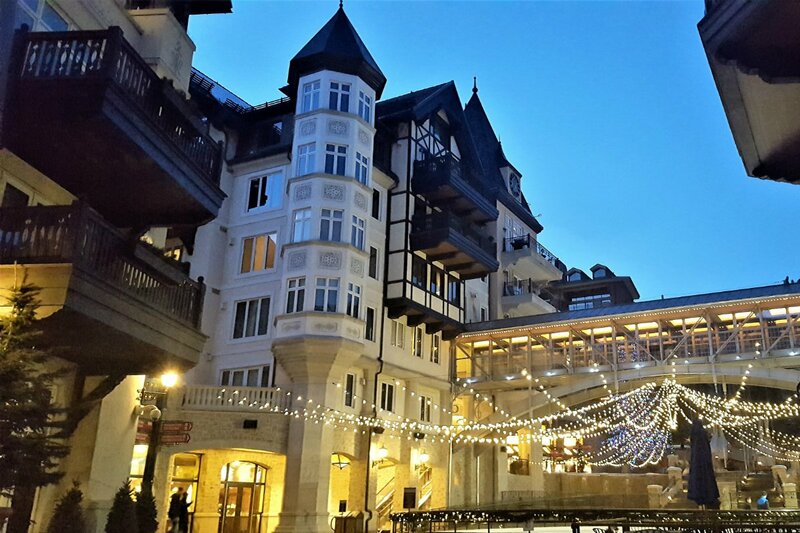 Vail village is known for its contemporary art scene. Gallery 166 Fine Art specializes in stunning regional artworks; Gallery V showcases international artists and sculptors. I saw a temporary display of ice sculptures at the Gore Creek Promenade — some were carved into chairs and thrones, which made for a fun photo op. 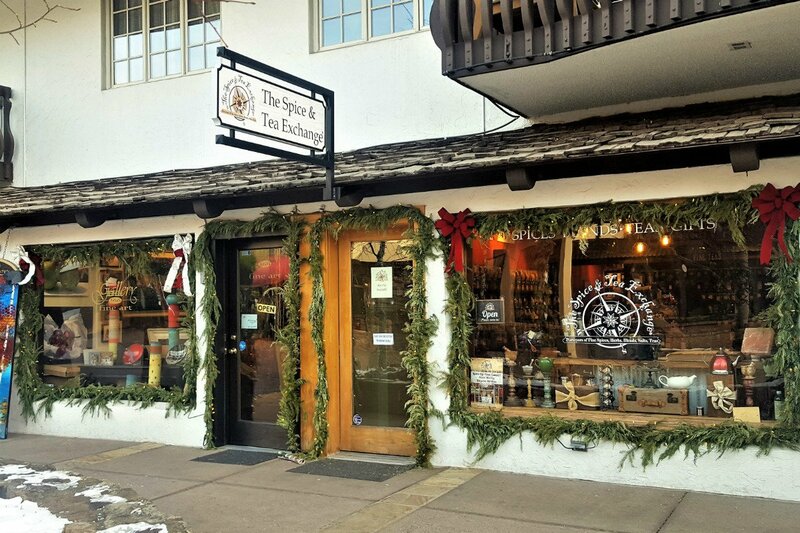 I found affordable gifts and souvenirs at The Gilded Spruce, a year-round Christmas shop that carries holiday knickknacks and vintage artwork with nostalgic charm. The Spice & Tea Exchange offers an extensive range of exotic spices, salts, sugars, and teas and will gladly make a cup to sample, from traditional Earl Grey to blood orange smoothie herbal tea. 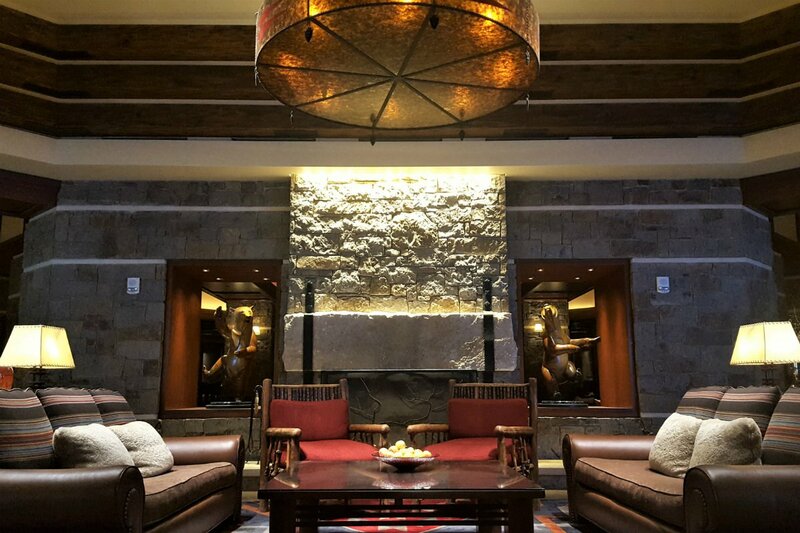 Back on property, I had an appointment at Four Season’s award-winning spa – the only Forbes Five Star spa in Vail Valley. I’m glad I gave myself plenty of time to enjoy the warm and inviting facilities enriched by hickory wood and limestone, because I didn’t want to leave the slumber room, the eucalyptus steam room, the sauna, the plunge pools, nor the outdoor relaxation garden by a roaring fireplace. The Spice and Tea Exchange in Vail Village. Photo by Yvonne Yorke. The spa relaxation lounge at the Four Seasons Vail. Photo by Don Riddle/courtesy of Four Seasons Vail. Highly recommended are signature treatments like the Intraceuticals Oxygen Rejuvenation facial – a good way to combat dry mountain air. Guys can sign up for Boots, Baths, and Bourbon spa treatments designed specifically for urban cowboys to unwind in a hot milk bath while sipping locally distilled bourbon, followed by a warm Bourbon Bubbler scrub, and an agave nectar oil massage for their aching limbs. Aprés-ski, we hit Four Seasons’s Remedy Bar for cocktails and conversation in the heart of the action. The Old Fashioned cocktail uses their own remedy barrel select bourbon, and another favorite drink, V, is made with Breckenridge vodka, made locally at the world’s highest distillery. An absolute highlight was Haute Chocolate – a treat for the eyes as well as the taste buds. I had it at Remedy Bar, though I could have ordered it through the Four Seasons app and had it delivered wherever I was in the hotel. Part of the magic was the presentation: It arrived in a traditional French hot chocolate pot containing Valrhona dark and milk chocolate, hot steamed milk, and Chantilly cream churned tableside. 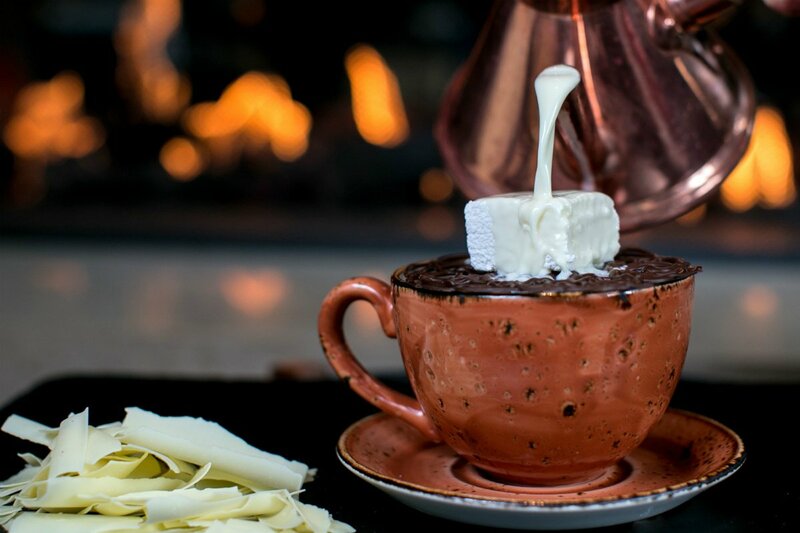 A latticework of handspun chocolate with a homemade marshmallow atop was placed over a teacup, the rich hot chocolate mixture slowly poured over it until the marshmallow melted into the cup. The result was the most decadent, wickedly delicious cup of hot cocoa I’ve ever tasted. Another extraordinary dining experience was a four-course, prix fixe gourmet dinner at Game Creek, a European, chalet-style restaurant overlooking the Game Creek Bowl. It is accessible only by snowcat in the winter, which marks the first time I’ve arrived at dinner in this particular mode of transportation. Standouts were the roasted Iberico pork loin with onion potato gratin and Colorado lamb with a mint herb crust. A robust way to end an outstanding adventure. Forget hot chocolate. This is haute chocolate. Photo courtesy of the Four Seasons Vail. Charming Lionshead Village. Photo by Yvonne Yorke. The author did an abridged version of the Mountain Adventure trip. The full experience costs $86,000, which covers the NetJets charter and a five-night stay for six guests in a three-bedroom residence at both Four Seasons properties: three 3 nights in Jackson Hole and two nights in Vail. All three NetJets / Four Seasons experiences are available on demand with 21-day advance booking through July 31, 2018. The jet can accommodate up to thirteen guests, though it can also be individually booked. In addition to Mountain Adventure, the other programs are Island Getaway to Lanai, Hawaii, where highlights include an oceanfront suite, private archery and clay shooting lessons, and exploring the island’s little-known wonders by land, sea, and sky. The European Escape immerses guests in the cultural and culinary heritage of Paris, Florence, Cap-Ferrat, and Milan. Yvonne Yorke is a writer, photographer, and TV broadcaster. You can follow her travels on Instagram. She travels for memorable meals, the yet-to-be discovered gem, and the perfect light sought by painters and photographers alike.